Open Letter to the US Representatives – Vote against S. 447! As representatives of a large group of the Polish Americans from across the country, we would like to inform you that Act S. 447, which is scheduled to be voted this Tuesday, is a highly controversial legislation and it should not be considered under suspension of the rules. On March 12th 2018, we have delivered to your office in Washington, a letter signed by 13 Polish American organizations which summed up our objections to the bill S.447 and included a brief legal opinion on the subject. Based on that information it is fair to say that this legislation is legally flawed, morally reprehensible and politically dangerous. We call on the House of Representatives to vote against Act S. 447 this coming Tuesday. The Polish Americans and the Polish community all over the world campaigned against anti-Polish and anti-American congressional legislation known as acts S. 447 (Senate) and H.R. 1226 (House of Representatives). We have objected to the proposed legislation and called particular attention to portions of the Acts that would undermine Polish-American relations and bring economic and political destabilization of Poland and Central Europe. Poland, the country with the second largest prewar Jewish community in the world, would be most affected by the proposed Acts. 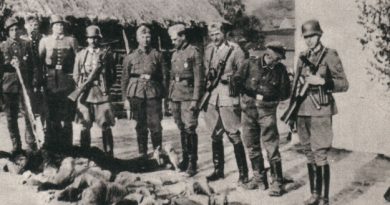 The legislation would mandate the Department of State to produce and present to the Congress annual reports describing level of compliance of different countries, including Poland, with the wishes of the Jewish American and international Jewish claim organizations expressed in the 2009 Terezin Declaration. Polish Americans support just compensation for Holocaust survivors, but in its present form Act S. 447 would require the Polish government to “compensate” for or hand over enormous assets to the organizations and/or individuals, who do not possess legal titles to any such assets, and who do not have any legitimate claims to the property left by the Polish citizens who perished heirless and intestate during WWII. Please be reminded that a mechanism presently exists in Poland and other EU countries, which allows adjudication of claims in a court of law by those individuals and organizations that have legal standing for each particular claim. This is the most effective and just means to address compensation issues. With respect to heirless property claims, Act S.447 has no basis in law. In all Western countries, the US included, heirless property escheats to the state. The issue of compensation for property nationalized, appropriated or otherwise taken from the U.S. nationals by the communist Polish People’s Republic was settled with the U.S. government by means of the 1960 treaty and indemnification agreement between the United States and Poland, which provided monetary compensation to all American citizens who had legitimate compensation claims. The financial burden on Poland and other Eastern and Central European countries, the loyal U.S. allies, of handing over the so called “heirless property” to individuals or organizations, with no valid legal titles or legitimate claims to any such properties, would, if this legislation is enacted and enforced, bring disastrous effects for U.S. allies in Eastern and Central Europe. The so called “compensation”, and in fact rather extortion demands, with estimates ranging from 65 to 300 billion dollars for Poland alone, would place an enormous, back-breaking weight on Polish society. Poland’s current annual gross domestic product amounts approximately 526 billion dollars. It is fair to say that the enactment of the S.447 would have an immediate, negative, souring effect on the Polish American relations. We would like to note that Poland was one of the chief victims of World War II. Our country lost over six million citizens (3 million of them ethnic Poles). Poland ended the war completely ruined. Polish citizens, ethnic Poles and ethnic Jews, experienced physical destruction like no one else in Europe. Poland suffered proportionally the greatest human and material losses of any country during WWII. After the war it was placed under an oppressive and brutal Soviet rule as a result of the Roosevelt-Stalin-Churchill agreement in Yalta in 1945. Poland has for decades been the most pro-American country in Europe. It has been staunch and loyal ally dutifully fulfilling its NATO obligations. At the time when U.S. relations with Russia are tenuous and deteriorating, the United States should not alienate Poland and other countries in Eastern and Central Europe. 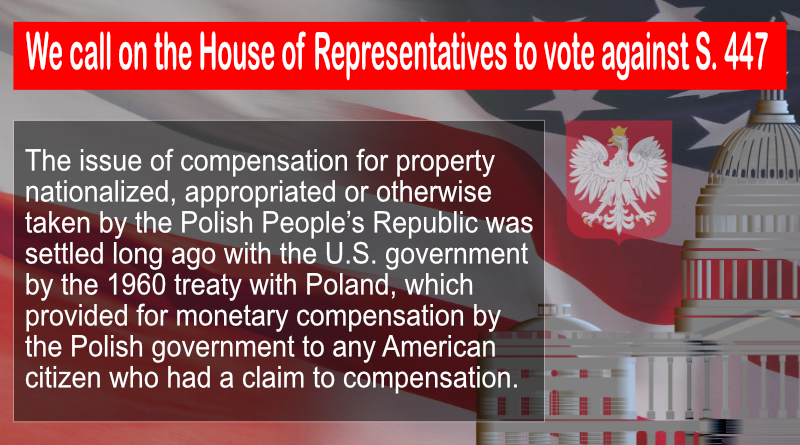 We must note with a great sadness that the House vote on S. 447 has been preceded by an unprecedented smear campaign against Poland in the U.S. mainstream media, a campaign that falsely portrayed Poland as a Holocaust perpetrator in order to facilitate extortion of “compensation” in blatant disregard of law and the historical truth. The House is about to vote in such a politically charged atmosphere on an issue of tremendous importance for global stability. Voting on S. 447 under such conditions without proper debate and adequate understanding of the ramifications of the outcomes would be highly controversial. Therefore, it would be in the best interest of the United States to reject the unjust ACT S.447 and maintain strong relations with Poland and other Central and Eastern European countries, your loyal allies! Edward Wojciech Jeśman Andrzej Prokopczuk, Ph.D., M.D.